The ingeniously simple Discovery 975 offers a custom blend of elegance and advanced technologies to keep you connected clearly, comfortably, and easily. A striking, minimalist design offers the simplicity of one-touch controls, while dual-mic AudioIQ and WindSmart technologies keep your conversations clear, even in harsh conditions. You have enough to think about without having to add an earpiece to your worries. The genius of the Discovery 975 is in its simplicity. Everything about this earpiece is designed to keep you connected comfortably, elegantly, clearly, and easily so you never have to think about it. As soon as you begin to pair the earpiece with your Bluetooth-enabled phone or device, you'll immediately see what we mean. For starters, universal connectivity virtually assures that your device is compatible with the Discovery 975. And thanks to Plantronics QuickPair technology, the steps on your Bluetooth device consist of turning on your device's Bluetooth feature and following the commands of your earpiece. That's it. Activate the Multipoint technology to easily pair your earpiece with a second device, so you can stay connected with one headset for home and at the office. A strikingly minimalist design defines the Discovery 975. From the subtle white indicator light that just flashes once when the earpiece is powered on, to the one-touch button that gives you control over powering it and answering/ending calls. A dedicated volume control doubles as a mute button for even more convenience. For the ultimate in ease, voice prompts keep you updated on the earpiece's mute and connection status, as well as the battery's low-power status so youll never drop a call midway through a conversation. 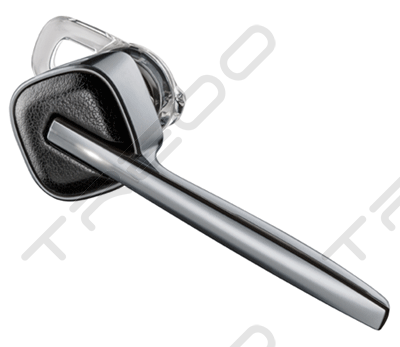 The supremely comfortable small, medium and large gel tips that come with the earpiece are so unique that they are patented. They're shaped to provide a secure and stable fit in your ear without interfering with glasses, and their flexibility lets you easily take the earpiece on or off. Beneath the sleek exterior of the Discover 975 are the advanced technologies that keep your calls clear and your voice sounding natural, even in a noisy automobile. The Discover 975 is built on dual-mic, AudioIQ technology. Two microphones simultaneously capture your voice and cancel unwanted background noise, and the earpiece's 20-band equalizer delivers rich, natural voice quality, so you can be heard clearly on the other end, the way you were meant to be heard. Meanwhile AudioIQ automatically adjusts incoming calls to clear, comfortable levels, so you can easily hear your caller. For less than perfect outside conditions, three layers of WindSmart protection keeps unwanted wind noise from interfering with your calls. Grooved vents in the earpiece's design deflect the wind, a layer of acoustic fabric blocks the wind, and electronic filters remove the wind noise, keeping your calls clear and wind-free. For down times, the Discovery 975 includes an ingenious carrying case that doubles as a charger. Perfect for airplane travel or extended down-time while you're on the road, the case features an internal battery that charges your earpiece while you store it, effectively tripling your call and standby time while you're on the road. An easy-to-read LCD shows the battery and earpiece levels, and also displays a Bluetooth symbol if it is connected to a phone. A handy eject button makes it easy to pop the earpiece out of the case when it's time to reconnect. The Discovery 975 is backed by a one-year limited warranty and includes a carrying/charging case, case strap, AC Charger and three gel eartips (S, M and L).